I would be lying if I said I didn’t watch what I eat. Call it pseudo-dieting if you will, but I keep a food and exercise diary at MyFitnessPal.com. I find it more interesting to see whether I am getting in the nutrition that I need – vitamins, minerals, fiber, etc. – rather than watching my calories. It is fun to me to experiment with different foods to see what my body likes best, how I feel when I eat a certain way, so monitoring what I eat with MyFitnessPal.com helps me see patterns. I’ve been eating a fiber packed breakfast every day, except today. Monday through Thursday I had a bowl of Meijer Fiber Complete oatmeal and a smoothie to start my day. Today I decided I was in the mood for something different, so I made myself an egg, drank some juice and had a bowl of Cocoa Pebbles. Each day I start off my work day in good spirits, not feeling stuffed or hungry but very satisfied. I’ve brought several food items with me to work that I can eat throughout the day. I paid attention to how long I was waiting between eating, and if I approached the four hour mark I made myself take a break and eat. I often work through my hunger pangs when I’m at my job, which usually results in overeating later. Keeping on top of my hunger and making time to eat has helped me from wanting to overeat lately. 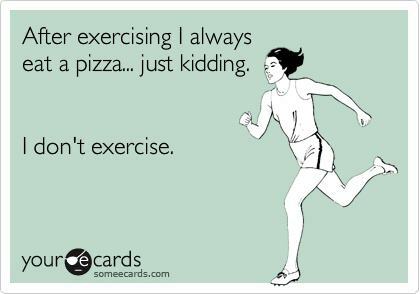 I’ve exercised almost every day. I don’t like to have a full stomach when I work out, so I usually try to get my exercise in as soon as possible after work. Sometimes “as soon as possible” isn’t until 6 or 7 at night, and I still haven’t had dinner. On those longer days I made sure to get a small snack in, usually a half serving of Carnation Instant Breakfast. The sweetness of the drink plus the nutrition helped cure any snack attack cravings and overeating later at dinner. I’ve made dinner at home every night except tonight. Last week I ate out almost every night during the weekend, and it made me feel very sluggish. All that sodium and overindulgence really wore me out. So this week I made almost homemade meals every night and paid attention to my serving sizes. I ate mindfully rather than scarfing down my meals (numbers 1-3 on this list also helped me to be able to eat mindfully). Tonight we ordered a pizza, which was delicious, and although I had an extra piece more after I was no longer hungry it wasn’t a big deal to me. Healthy living isn’t about perfection every day, but averaging out your choices made for health and your choices made for pleasure. After all, pleasure is a big part of wellness. … I didn’t drink caffeine later in the night. I used to always drink my Diet Mountain Dew right up until I was falling asleep. While I’m guilty of that today (I indulged in a regular Cherry Coke to go with my out-of-this-world delicious pizza), every other night I have made sure to bring water with me to bed rather than a pop. My husband has been sick and has been sleeping upstairs in our loft with the TV on all night, which normally would wake me up – but not this week. And every day I have woken up before my alarm feeling well rested. The benefits of watching what I’m eating and eating smart versus being on a diet are much more satisfying than any number on the scale. Of course I want to see myself get more and more fit, but I will be more proud when my fitness is evident through beating my best times running, being able to do a REAL military style push-up, and fitting into my clothes better. Its all about being realistic!